I have not found a group to go with me to Chynnis, my currently favorite Chinese Restaurant at SSTwo Mall again because every weekend I’m either doing a class, or my friends are away and getting a few people together seems quite difficult. And I certainly cannot go there just for a bowl of soup!!! So I had to resort to my own devices for some nice soup hence my Chynnis Inspired Fish Maw Soup. This is not Chynnis the Restaurants Soup, it is my own interpretation of what I ate and I think it is pretty close in flavor and all, but most importantly it was simply delicious and it was what I needed that day. 1. 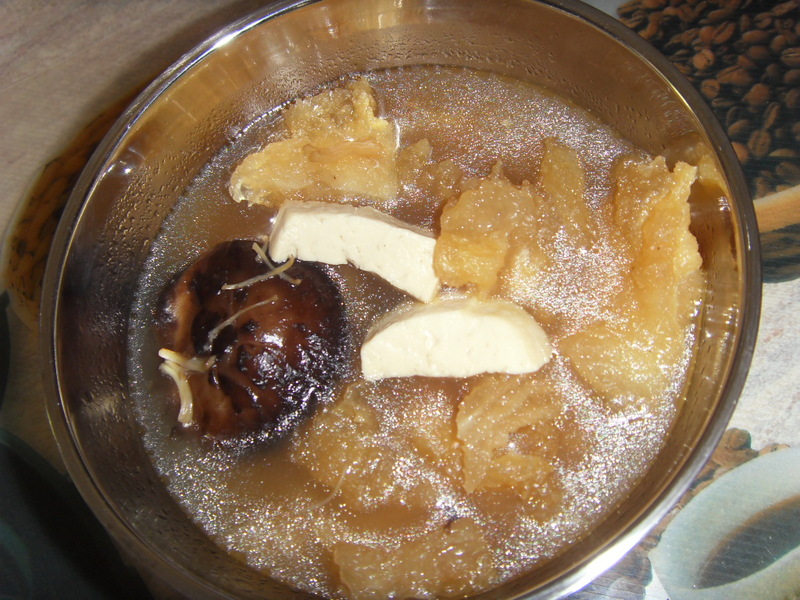 Boil stock, dried scallops, ginger and mushrooms till scallops are torn apart and mushroom is soft enough. You may use more mushrooms if you like, but then the flavor could be too strong. This boiling should take at least an hour. Simmer on low flame. Season to taste. 2. Add in Wine. You may add more or less depending on the strength of the taste, I like it stronger. 4. Season to taste again if necessary. 5. Lastly add in the tofu and do not stir as the tofu will break up. Serve hot. 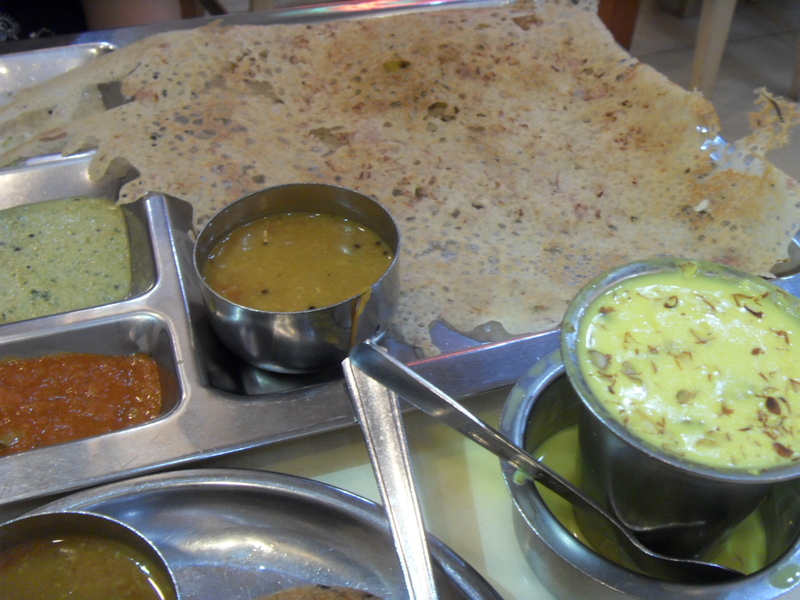 Saravana Bhavan – Indian Vegetarian Restaurant – PJ State. It was a dinner date that was all mixed up, all because the other party was half asleep and I did not read his sms so at precisely 6.30 pm, Kress was outside my house waiting for me and I who just woke up from an unnecessary late afternoon snooze went helter skelter running around to get ready and was out of the house in 10 minutes complete with sleepy face. So since we were not scheduled to go anywhere it was a toss up between Chinese and Indian, and since someone sent me a comment the other day saying I was discriminating because I only seem to talk about Chinese Food, which is something that is so not true although I must admit I do tend to veer towards Chinese Food because of the variety and different cooking styles. And I do go to Indian places but I have to admit I do not eat spicy food and whilst all my friends of different races would be stuffing their faces with mutton curry and fried chicken and copious amounts of vegetarian dishes, and the fried fish and roti canai and all, I am a Rava Thosai person. 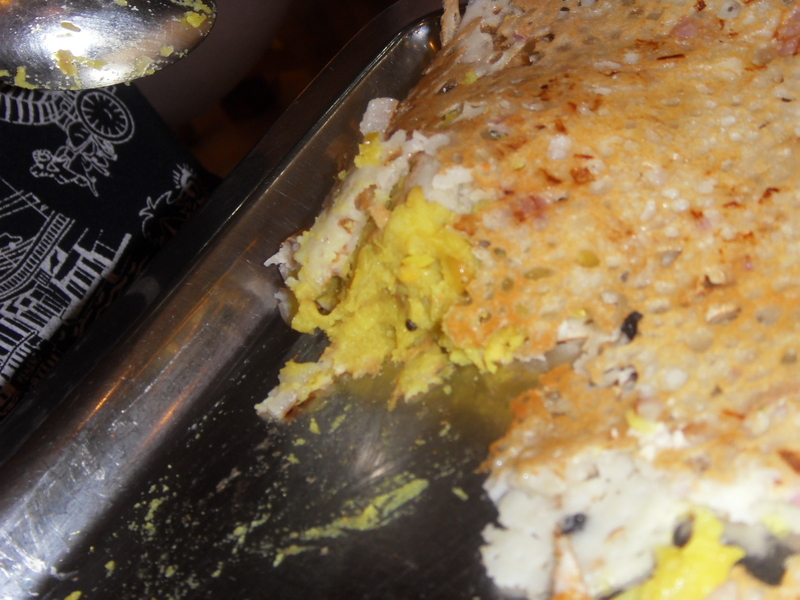 Rava Thosai and Coconut Chutney. Anytime of the day be it breakfast, lunch, tea and dinner. Also I don’t like spicy hot food and at times I won’t even eat my Thosai with coconut chutney if the chutney is too spicy. So ladies and gentlemen, hence for the non Indian food critique. I mean there is only so much I can say about thosai. I do have photos of places I eat at, but its always the same old thing. Well today I decided on Saravan Bhavan. Now I have been to two of their outlets, one in Bangsar and the other in PJ state. 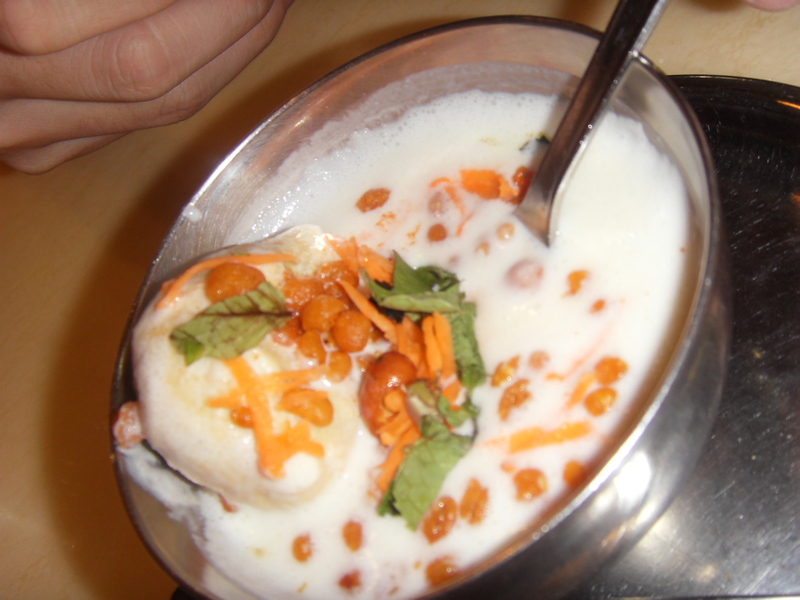 Saravanan Bhavan serves vegetarian food and has outlets all together, and it is also worldwide. So expect something different when you go there. I mean with outlets in India, Canada, UAE, Bahrain, Qatar, the USA, UK and Singapore, I am sure you would not go wrong eating in a place like this. Now why I choose Saravan Bhavan? I like the comfort of being seated in an air conditioned place, choosing stuff from a pictured menu, where the kitchen is away from the customers so you don’t feel the heat and stickiness, and where these Indian cooks cook a whole lot of varieties of Thosai, and a lot of other different Indian staples like Chappatis, Pooris, Idlis, Bhaturas, Naans and Parottas and various other Southern Indian cuisine in comfort. I did a rough up and down count of the menu and found close to 300 dishes in all, and they even have a Chinese Corner. This will be another episode obviously. So we got seated, parking was a cinch by the way being Saturday evening and all. We got a park right in front of the restaurant. I had a bit of problem understanding the waiter, I really did not understand what he said and in true Kress Thong fashion, when you don’t know you smile and point so that’s what I did since being colored, it meant the waiters would ask me what I wanted instead of the Chinese guy. Funny how that works in most places. So we ordered Gobi 65, Medu Vadha, a Curd Vadha, an Onion Masala Dosa and Paneer Dosa and for beverage we had Masala Milk. Frankly speaking I had no idea what I ordered, I knew what they were ingredients wise but I did not know what it tasted like. So out comes the Curd Vada, which is Vadai soaked in a slightly spiced yoghurt. 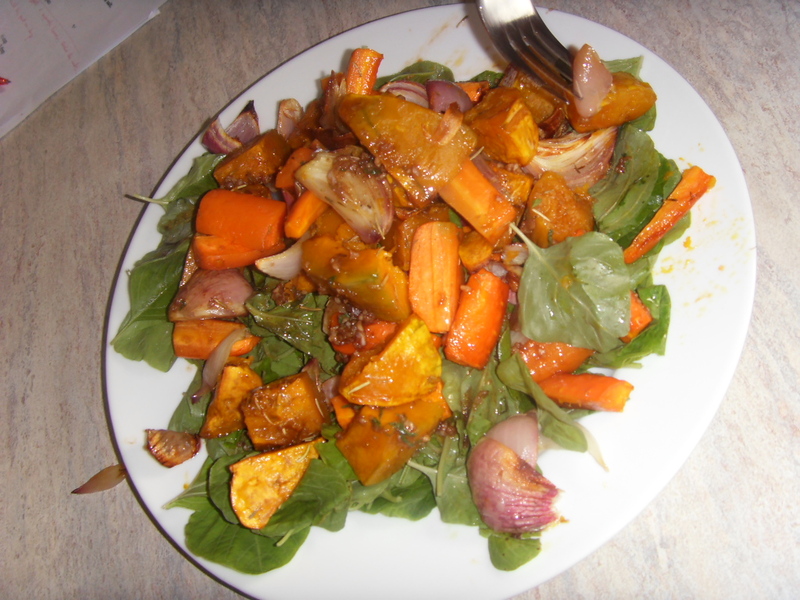 This was topped with mint leaves, a bit of grated carrot, and little crispies which most of us would be used to eating it as a snack. Still those crispy bits added a bit of crunch to this rather wet dish. The yoghurt was fresh yoghurt and so it had a nice cooling taste to it. In fact every time I bit into something spicy I took a spoonful of yoghurt. 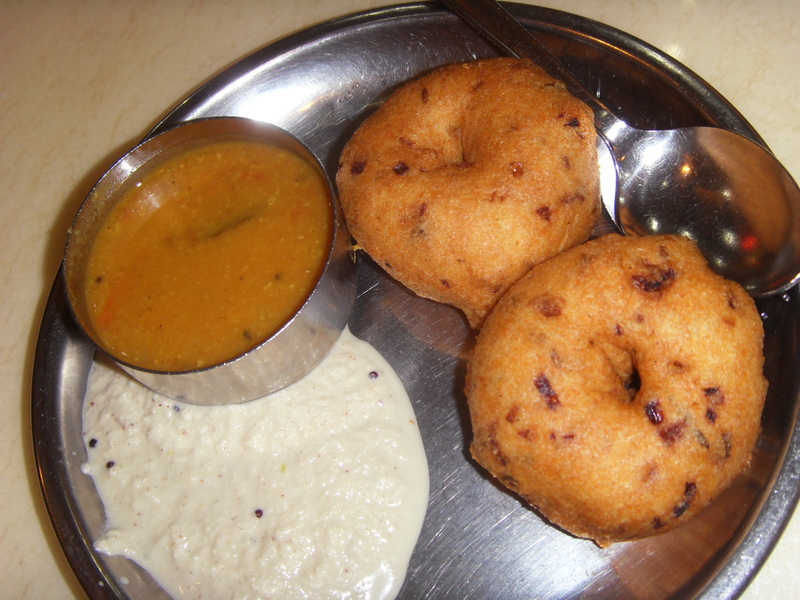 The second appetizer was ordinary vadai with coconut chutney and dhal curry or sambar. Rather ordinary I might add, but still it was nice. I could have chosen something more daring but I thought since Kress hadn’t eaten here before so I thought it would be nice to play safe. I wish though, that the Vadai was served freshly fried and piping hot. It would have been a lot nicer and a tad bit crispier. Now our Masala Milk was not something I had expected. 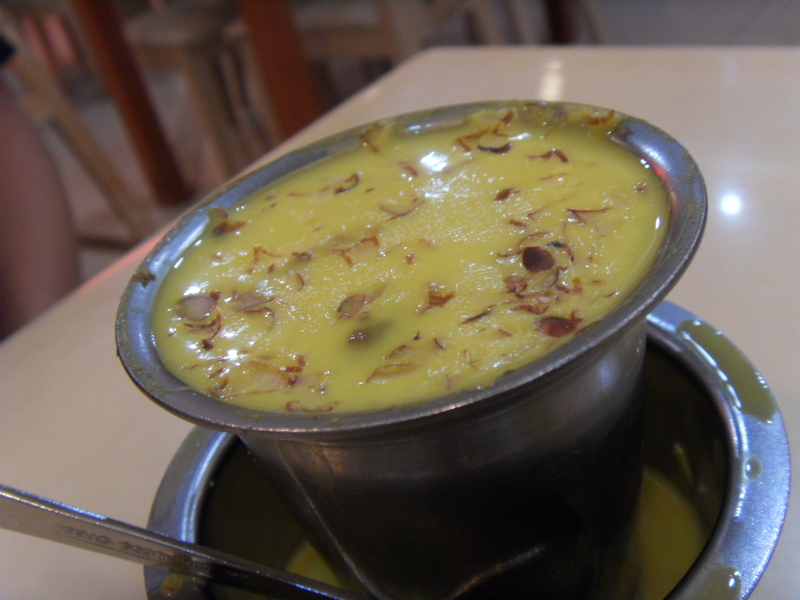 It was filled to the brim and it had saffron (not turmeric) used to color it yellow and it had bits of almonds. It was not sweet at all, which was a bit strange because Indian milks are usually sweet. Perhaps in my lack of understanding of what the waiter had said, I may have nodded and smiled when he said less sugar. It was different and rich, and I could have had another cup. Also I wondered why it was served in slightly bigger bowl like cup, I thought it was so that the milk would not spill. Well silly old me… culture shock! The reason it was done is that so one can cool the milk a little and make some froth much like a cappuccino or frothy milk. Well we learn! Actually I learnt it from the Chinese Family sitting at the next table. After watching them, then only did I realize others were doing it as well. Do you notice any masala???? 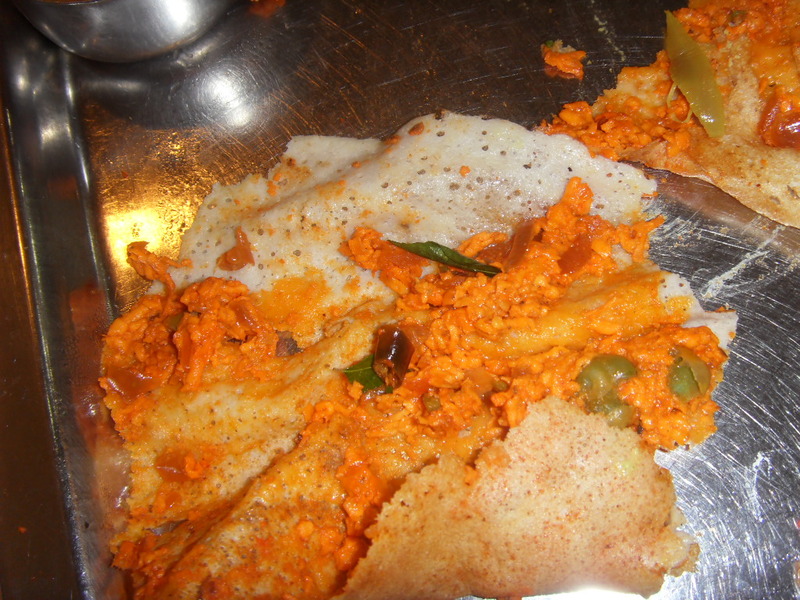 only found the Masala (thick potato and spices) folded at the end of the Dosa, which was strange because we only found the filling quite by accident and so that particular meal experience was lost. 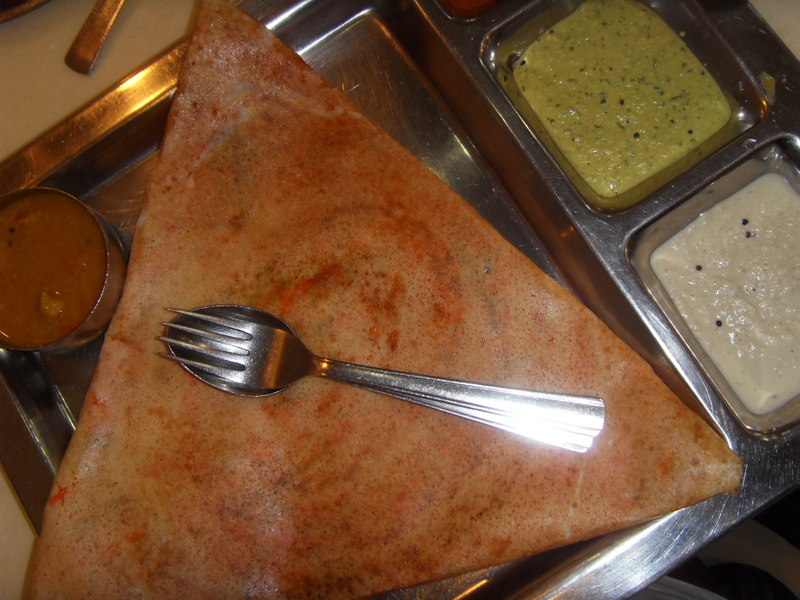 As far as I have always known, a Masala Dosa always has its filling in the middle of the dosa. 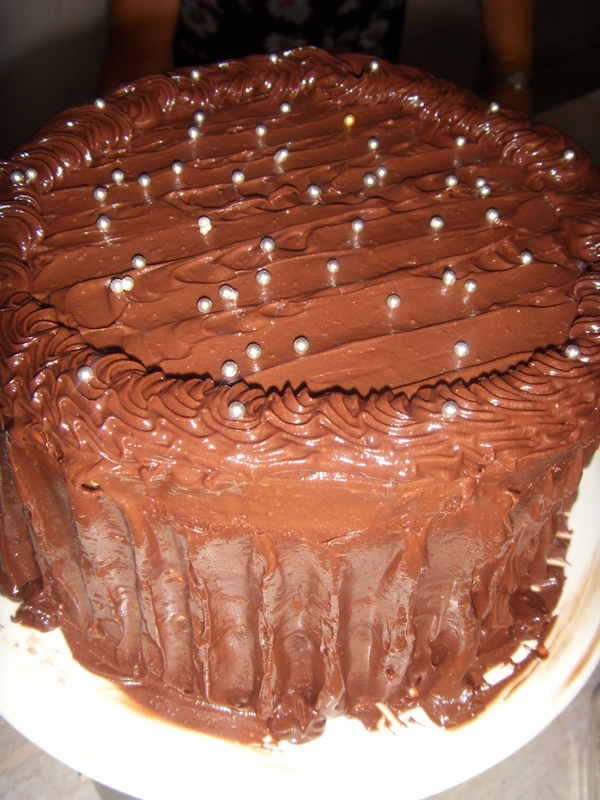 So once you cut through it, the Masala filling is visible. Well maybe they forgot about the filling till the very last moment. 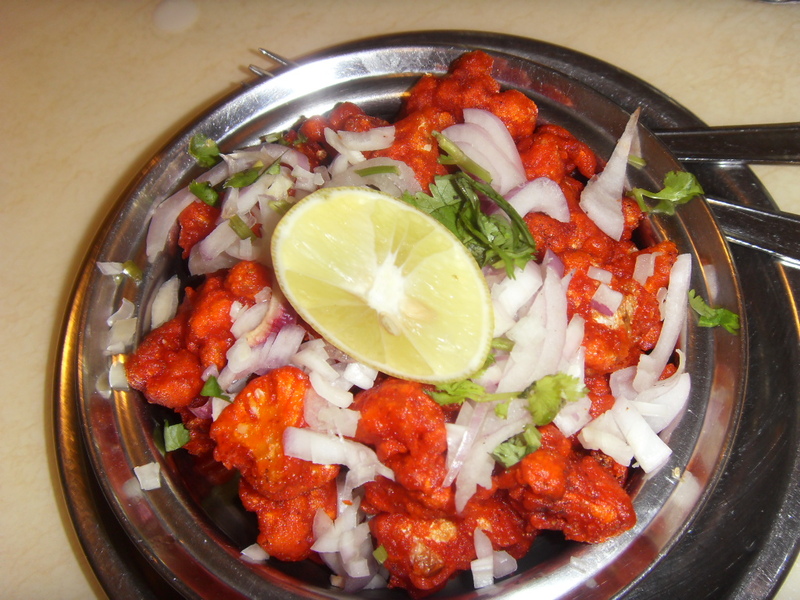 The Gobi 65 came and it was fried cauliflower, which was coated in I believe a chick pea floured tandoori spiced batter. I was crispy and nice. Much like a tempura only with a bit more ommph! Drizzled with lime juice, to me this was the best part of the meal. No doubts everything was nice, but this one took the cake. Each cauliflower floret was coated well and none stuck to each other. 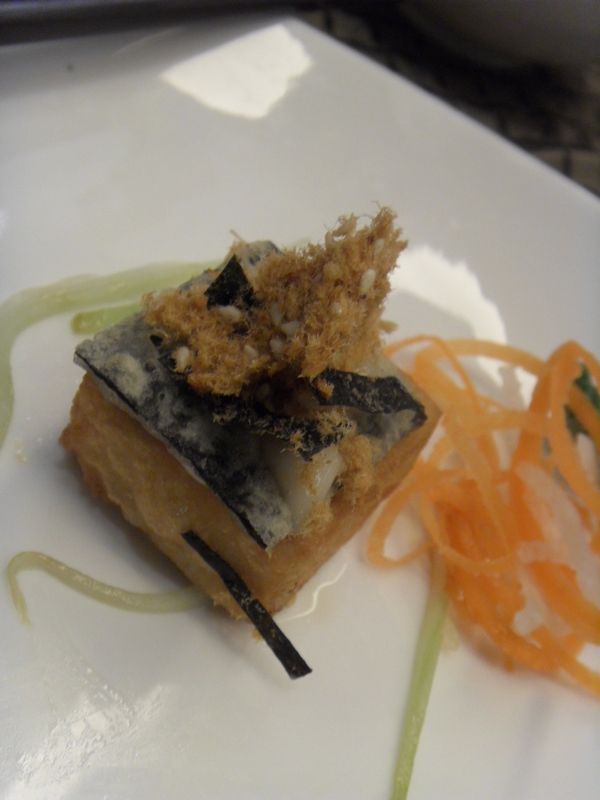 I have had tempura vegetables all pasted together a few times and this would look like a shocking oily piece of mush. Not Gobi 65 though. It was perfectly fried I thought. Just lovely. My paneer was mixed with Tandoori ingredients and had a nice taste to it. There was a slight bit of spiciness to it, a bit too much for my liking, so I ended up finishing the yoghurt from the Medhu Vada. Still the taste was nice. No complaints at all. I would recommend it and order it again. with two fingers ended up with us getting 2 pieces of Palkova and I, in line to eating healthy, ordered a Mixed Fruit Ladoo. We both enjoyed it a lot. 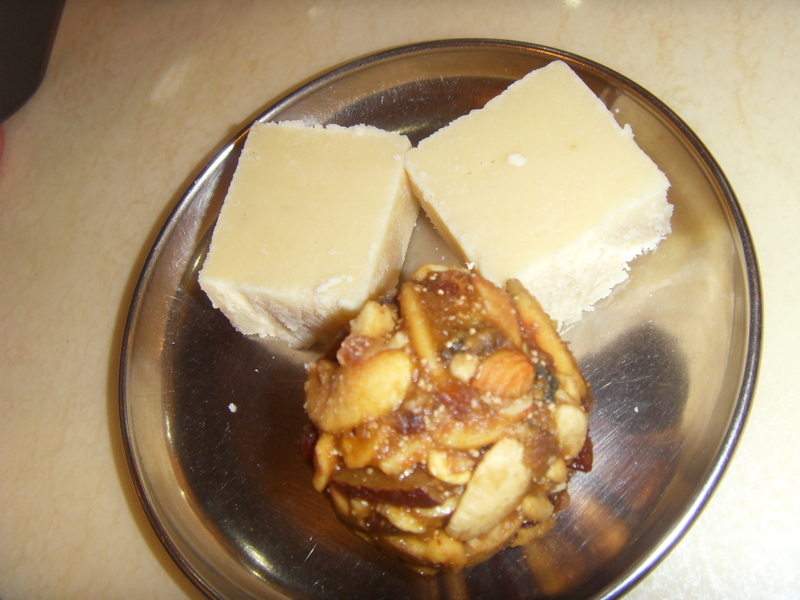 Kress was not to keen with the Mixed Fruit Ladoo because he said it was much like fruit cake. The Palkova was perfect, really it was. What a sweet ending to an unplanned night. For those who prefer less fuss cooking, and something really different, let’s do roast this Easter. 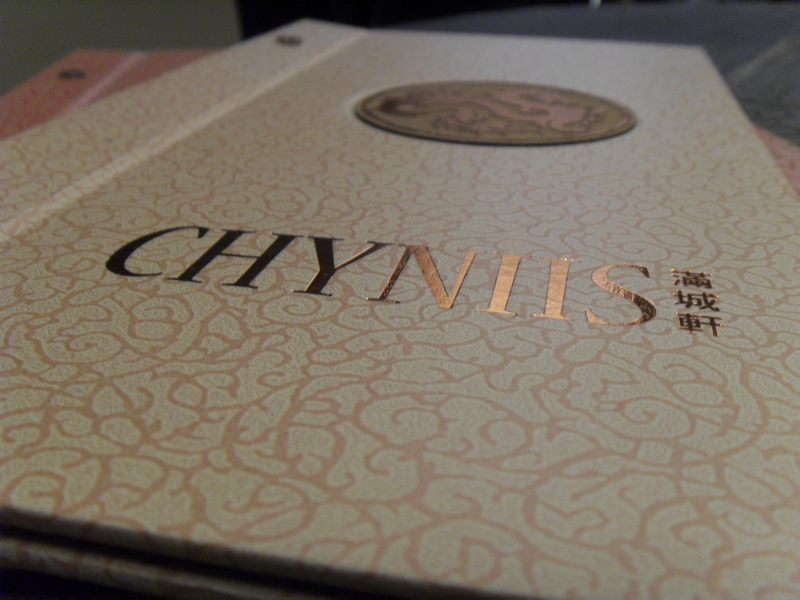 Chyniis – The New Kid on the Block- The Much Needed Gem of Chinese Cuisine – SSTwo Mall, Petaling Jaya. I was invited for a Chinese dinner and it was to be Cantonese Food with a nouveau twist so in my mind I had this notion of Noodles with Cheese with a hint of Italian Spices or soaked in béchamel sauce and topped with three types of cheese. I even pictured pork spare ribs with an Indian twist to it, I had all this in my head I really did. So I went for dinner with Kress with no expectations at all. Furthermore every time I passed SSTwo Mall, I saw a number of restaurants I would personally pass off as mundanesville which I had noticed in other shopping malls in KL and PJ and for some odd reason I never noticed Chyniis. Walking around SSTwo Mall was quite daunting. It was huger then I thought it would be. I never knew it had an entrance and on entering one might notice the shopping area is still very empty with a lot of potential and a lot of growth. It is very cold too, because of the lack of body heat ie people. Anyhow, we walked through the foyer, and interestingly the place is divided into two sections. The part I had always seen was the SS2 side in front of the terraced houses. I noticed quite a few Chinese Restaurants the kind I had in my head at that moment, the kind that dished out Szechuan meatballs with bok choy, and congee with minced chicken and pork balls, the mind was just boggling thinking I was going to waste my time and eat something I was not too keen on. Now we walked on and then I noticed a rather elegantly done up restaurant, rather tastefully too with many well uniformed staff and a manager standing around in a tuxedo. “Can’t be this one”, I thought to myself and then I walked to the front and noticed it was two shops and low and behold it was Chyniis. Well thankfully I did not open my mouth and say anything to Kress about my thoughts because I would have had to eat my words right then and there. The ambiance of Chyniis was simply charming. Not one with pretense class but a restaurant that was warming and welcoming. I was still in shock. I was guided to my table and I noticed the restaurant to be spacious and elegant. Tables and chair were arranged far enough that I would not be able to overhear what my neighbors were saying and the back of my chair would not hit the chair behind me. Now these are little things I always look for in a restaurant, because most restaurants in PJ and KL are made for people who are size zero! Well I’m not size zero as you know, not even if you add a one, two or three in front of the zero! I chose to sit at the last table so I would face the restaurant and see who is who, a busy body by nature of course. The owner KH Saw sat me down and proceeded to help me with the menu seeing that I was the only colored person around. Well after a lot of namby pamby and being fussy and saying yes and no and I prefer this to that, we waited for our food. As I was with my little camera, Saw decided to join us, or as he put it, “we can order and eat more”. He also sat and explained the whole concept of the restaurant because I was quite alarmed that he opened something as lavish as this facing a housing estate….an old one I might add. So our little appetizer came. I half expected steamed peanuts or worst still fried ones, or even tacky vegetable crackers, but again I was surprised, we were served with fried shrimp. Simply marinated with salt and pepper and fried, it was just the right crispiness and softness and I asked how this was stored because surely these little bitsy shrimps would not taste nice the next day. I was assured that it is fried daily. It was just perfect skin, tail, eyes and all. 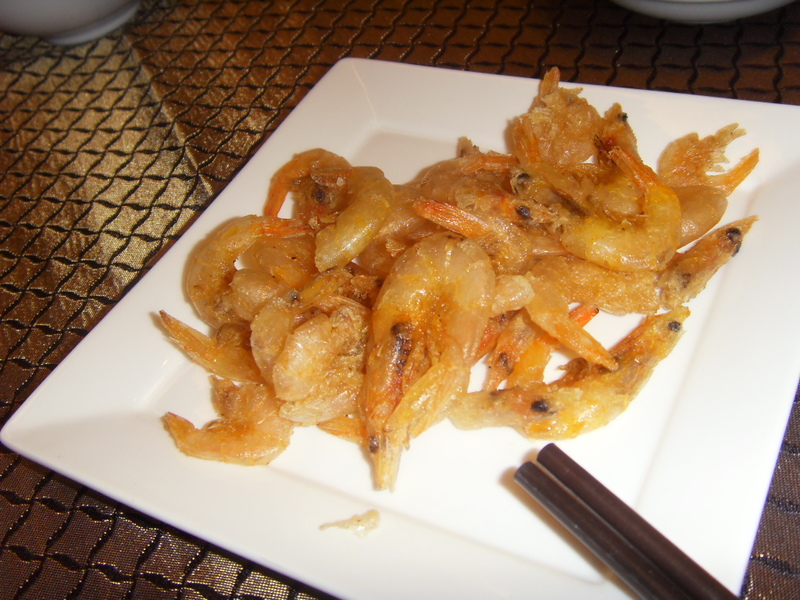 I did remark that some of the shrimp were a little too big to ensure uniform crispiness, but Saw assured me that since it was done daily, it was not a problem to ensure crispiness. Still I have to say I liked it a lot. So did Kress who was quiet all through. The next dish was a bit of a surprise. Caramelised Pork Belly topped with Rolled Chargrilled Cuttlefish. Now this dish is certainly not something someone who has to watch his girth should be eating. I ate it nevertheless. 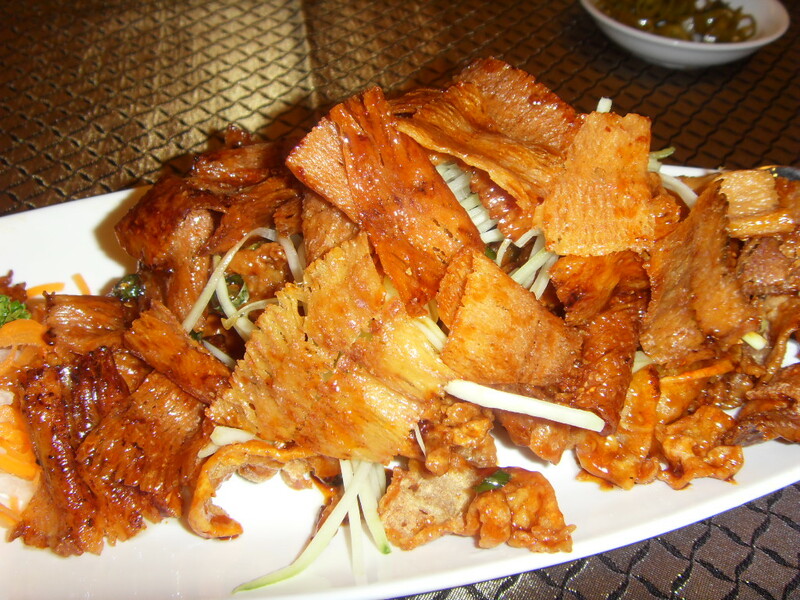 The Crispy Pork Belly was fried to perfection and to a perfect crisp. I did not understand the inclusion of the Chargrilled Cuttlefish, but in a strange way the two flavors seem to gel. Then again if you are not fond of caramelized pork belly, then eat the cuttlefish. I did my taste test and ate the meat 30 minutes later, and it was still crispy to perfection. Caramelizing a meat is something that has to be done at the right temperature and timing is so important. This was perfectly done. We did not have any rice because I’m supposed to be on a low carb diet (Stop Rolling your eyes… all those who know me!) but let me tell you they use good rice at Chyniis. I could smell it from the next table as soon as it was served. I always think good rice brings on a bigger appetite to eat. Thank goodness I’m on a “diet”. 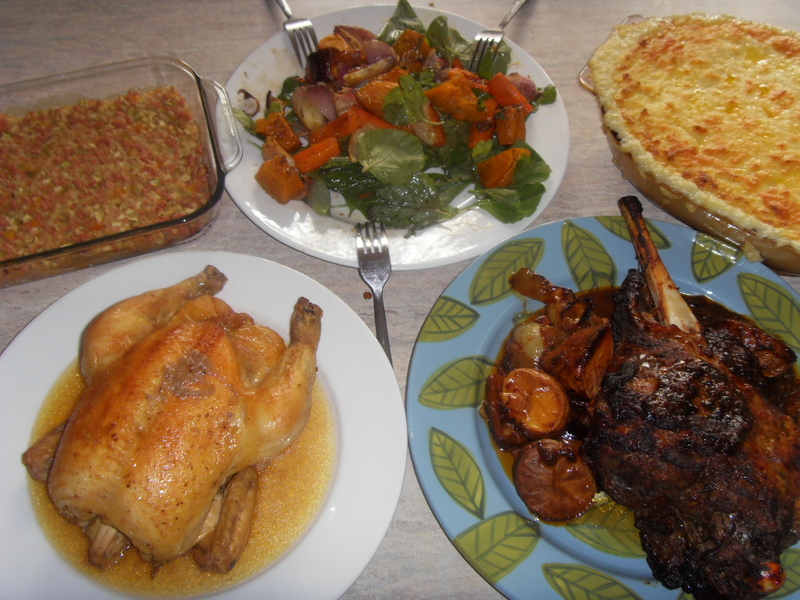 Now most of my avid readers would know I love morsely food, ie food that are small and about one or two mouthfuls. So the first dish was something easily picked, and so the second dish comes and it was oh so wonderful to have a second pick pick dish. This little pick me up to eat consisted of home made tofu, topped with fried crispy seaweed and then topped with copious amounts of meat floss with sesame seed. mayonaisse made to look like net. I thought this was just divine. 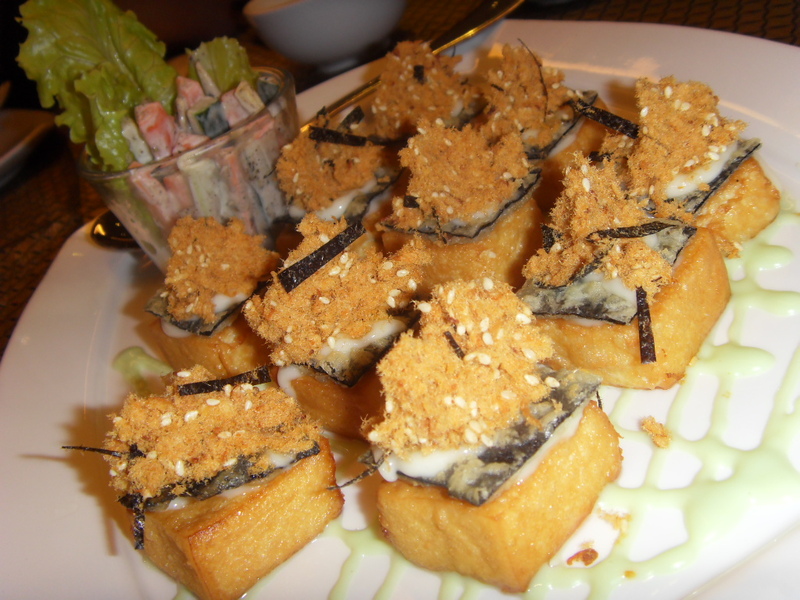 The tofu was perfect and it went so well with the crispy sushi. 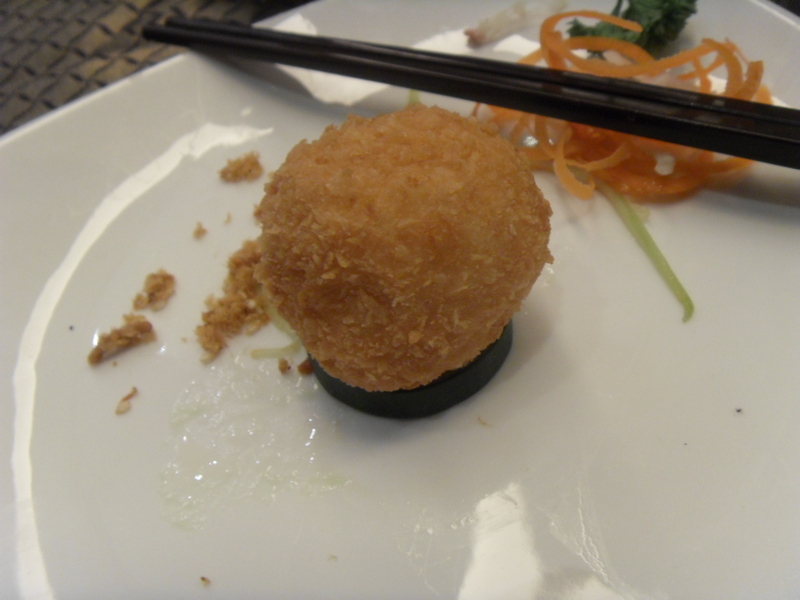 I did mention to Saw that there was too much meat floss as it tended to kill the flavor of the tofu and the sushi. Less is more sometimes. I suggested they remove about 1/3 of the floss and it would be just perfect, and I even tried it by removing a bit and it made a lot of difference to the three distinct tastes. I will order this again when I go to Chynnis and with less chicken floss please. Next Saw recommended I try the Homemade Squid Balls. Now I hate balls of any sort! 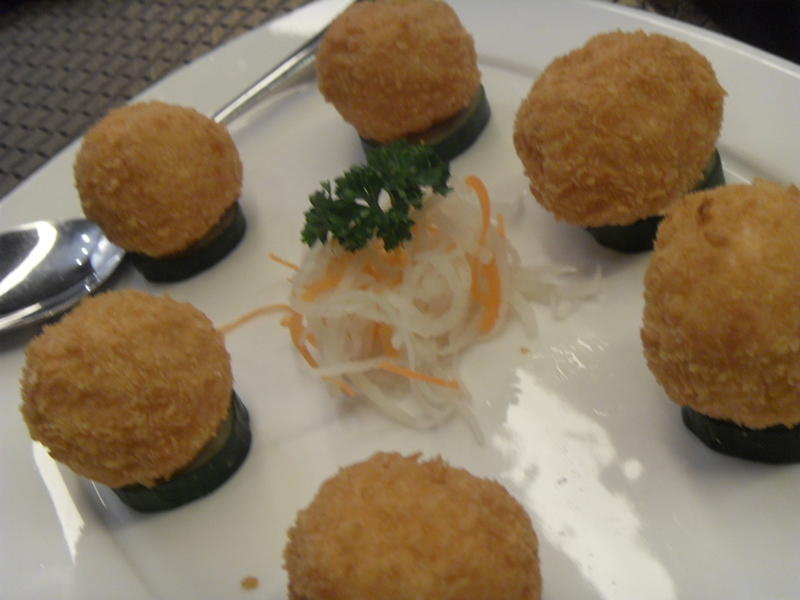 Chicken Ball, Fish Balls, Pork Balls, Beef Balls are just not my thing. I did have a maid who made wonderful fishballs once long ago, it was so good that she was the talk of my housing area, that I did not mind because she made it well and very pure. I again had my reservations, but since the owner of the restaurant ordered it so be it. was gratifying. I did not expect this at all. It was demurely placed on a piece of hollowed out cucumber with a tiny bit of mayonnaise, and I thought it was another wonderful morsel food. Taste test, 30 minutes later, it was still hot and full of flavor. Why was it hot after 30 minutes? Because the sotong ball was pure squid meat and that meant compacting it tightly to prevent it from breaking apart. This would have been different if it was ordinary sotong balls which would have shriveled up after 5 minutes in front of my face. I did complain that the ball was too big. I like my balls two bite fulls at the very most, but this was three and the fact that I do have quite a big mouth, it was three big mouthfuls. Again less is more. But again it was perfect. 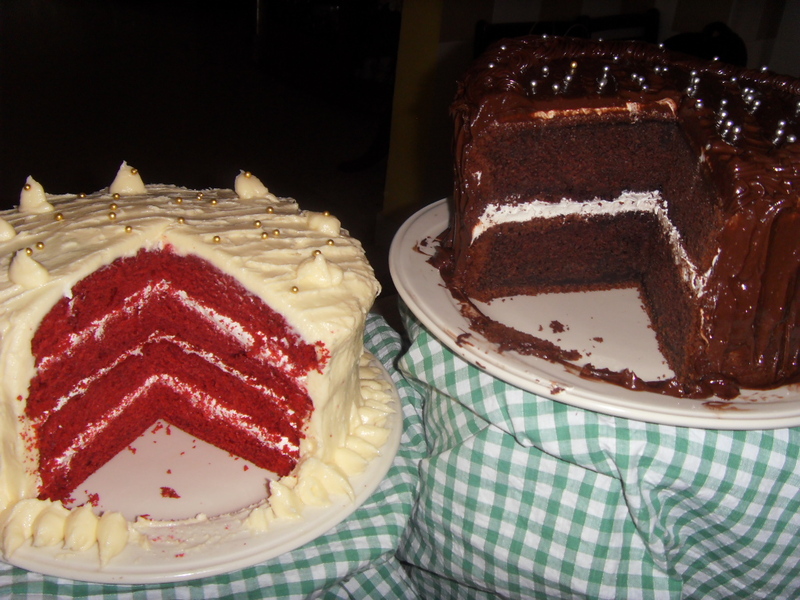 Perfect in appearance and perfect in taste. I wonder though if there would be another kind of dipping sauce for this? For some reason our soup came next. I did expect it to come in the beginning but it appeared now. I was busy talking but at the side of my eye I did notice Kress eyebrows rise when he tasted the soup. I love soup, so I expect a good soup. Ladies and Gentlemen… this was by far one of the best soups I have had in a long long while. 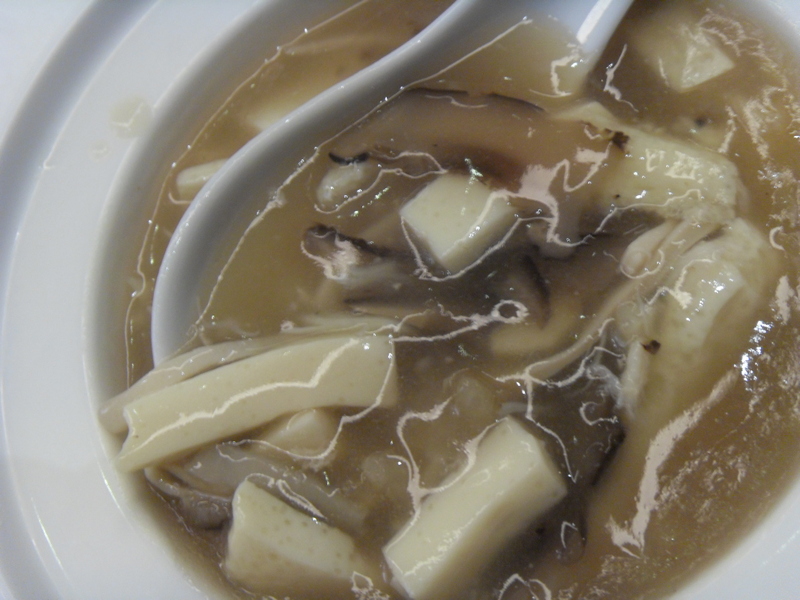 It consisted of Fish Maw, Homemade Tofu Strips, Fresh Crab Meat, Strips of Mushroom I believe simmered in superior superior stock with Tawau Heng Chew Wine. I could have had another bowl. It was just perfect. I could just go to Chyniis and order just the soup and go home very satisfied. The soupy thickness was thickened more so by the ingredients that was added instead of cornflour as with most places. The texture and the mix of flavors was perfect, nothing overpowered the other, you tasted everything you chewed. Sadly I did not taste test it after 30 minutes because I gulped it down under five minutes. In fact the three of us, owner of the restaurant included polished our bowls. I wanted more, but I was too polite to ask. awesome. 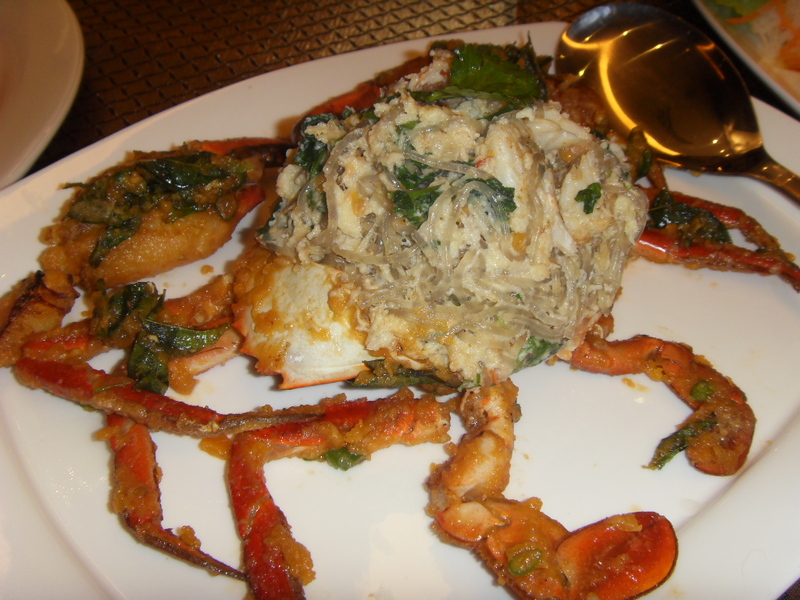 I am not a fan of crabs because of the mess and so the chef created a dish because a lot of people like me exists out there. My verdict. Perfection! This is a typical example of using good ingredients and so the flavors come out and gel with each other perfectly leaving the palate asking for more. It was a perfect combination of fusionizing two strong flavors. The scrambled egg noodles with crab meat was really nice with that bit of Tawau Wine. 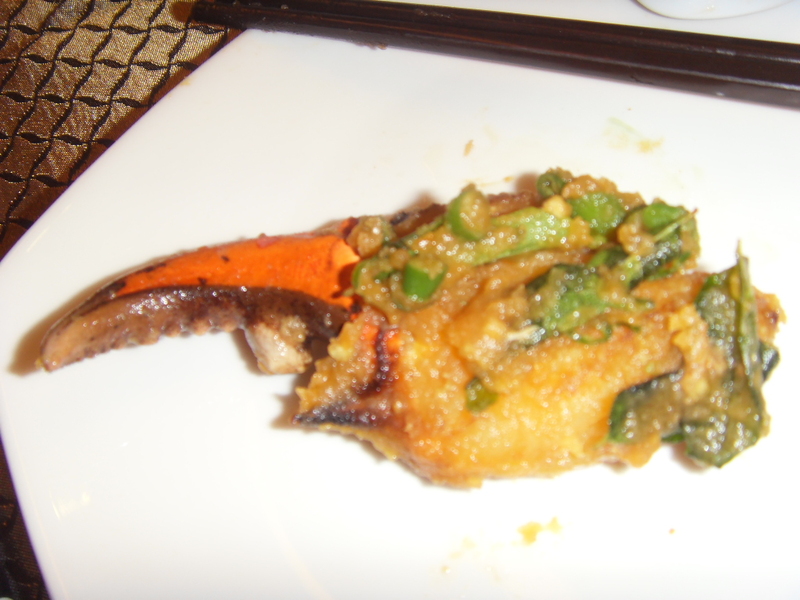 I actually had a crab claw, coated nicely with salted egg yolks and curry leaves with a light hint of birds eye chillies. Another top scorer in my book. I asked Saw how this dish came to be and he said he gave his chef the run of the kitchen so as not to hinder his creativity. This is something a lot of places should allow if budgets permit. A lot of restaurants and even hotels claim they want their staff to think out of the box but the box must always work around the hotel or the restaurant. This time I feel Saw worked around the food and then priced it. A lot of places and some of my clients start pricing food even before it is prepared and tried, this hinders the creativity of any chef. This I think has made Chyniis which opened January 18th 2011, a stand out. Already they have a good following of VIPs and even politicians. In fact I even noticed some fellow foodies who don’t spare a thought of spending money on good food. One of them was sitting in the next table. And it was not his first time to Chyniis. In one month and a half, Chyniis has managed to carve out a name for itself. In fact by this time almost every table was taken. A rare sight to behold in most new restaurants. I do hope they will get the necessary attention for food awards and all this year. The Eat Me If You Dare Look. 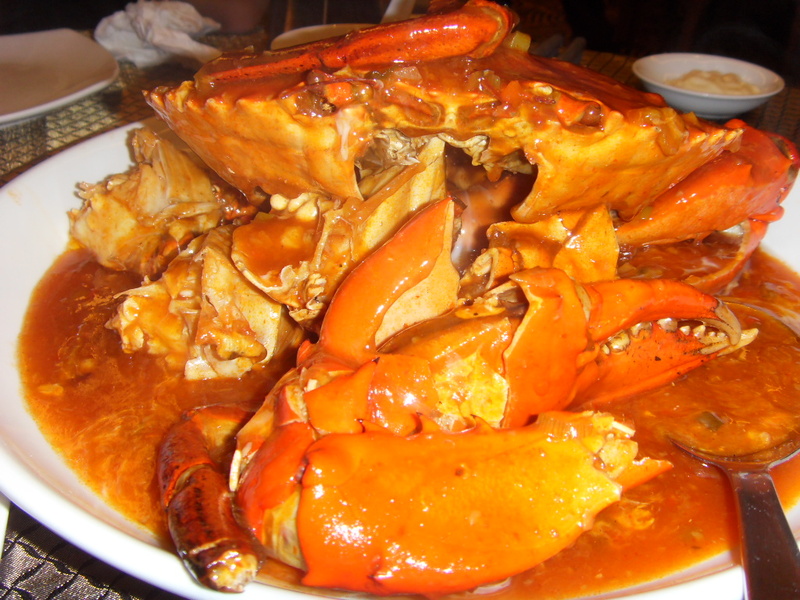 Finally, Hot and Spicy Chilly Crab. I have not eaten a crab this big in my life. 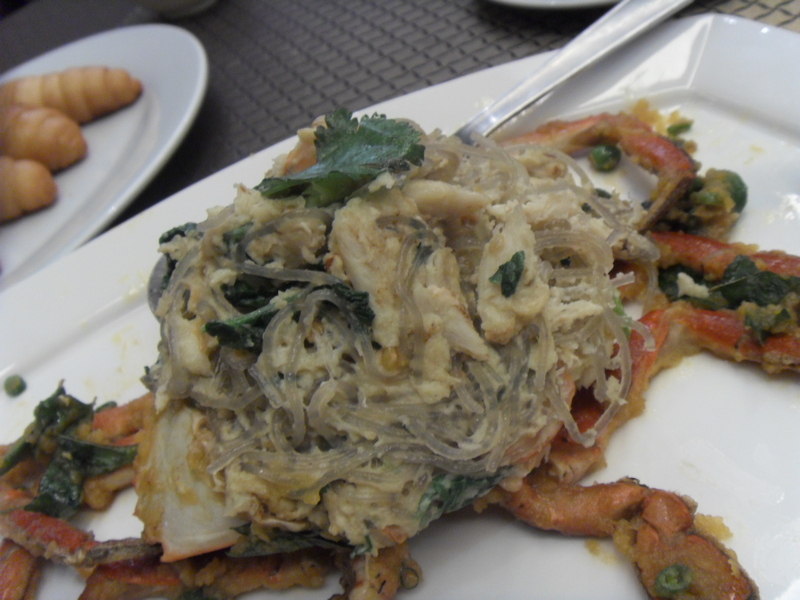 Having said that I am not too keen on crabs so even if my mum make anything crabs I seldom eat it but this one was one fierce looking crab who dared you to eat him. I reckon if he was alive he would have eaten you up! not a big crab by Chyniis standards. was horribly red with chilly paste and you could see the seeds whole seeds which was a put off to me. 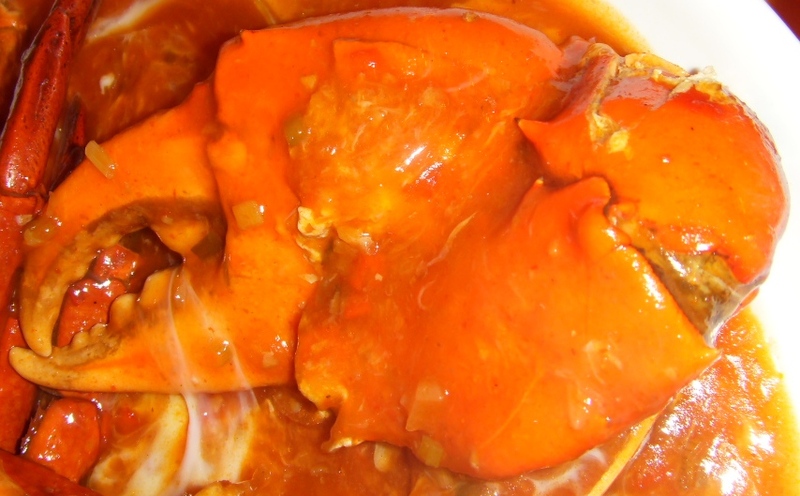 I used to wonder why waste good flavored crab by killing it with chilly. Well this is not the case with Chyniis Hot and Spicy Chilli Crabs. The crab oozed flavor and the meat was like eating real mansized Crab meat, not the young sweet crab meat fit for the girls. This was a man’s Crab! And Kudos to the chef because, “He the Man”! I saw Kress devouring a large claw. All this time he has been quiet mind you. The gravy was almost silken, full of flavor yet not obvious to the eye. Shamelessly I asked Saw if I could pack the balance Crab home. And I had the sauce with Toasted Bread for breakfast the next day. It was simply blissful! Dessert came, it was delightful iced mango slices and with rockmelon. 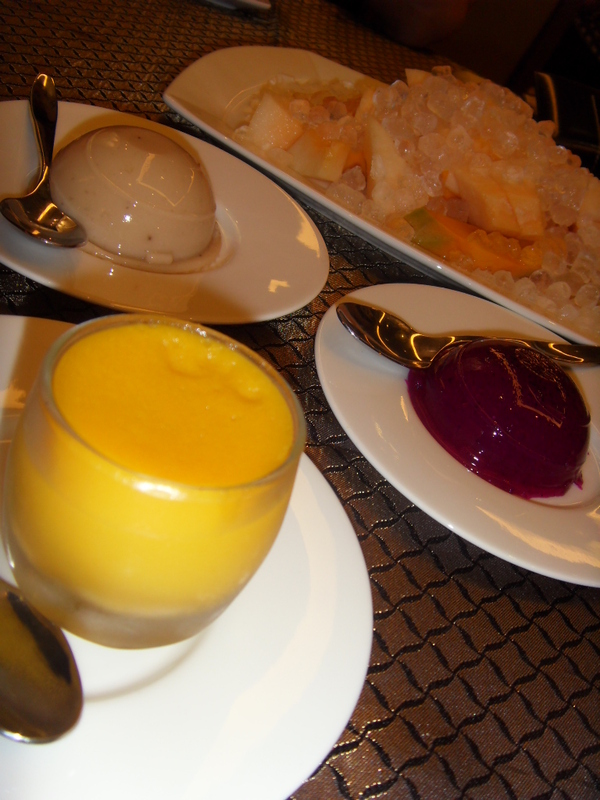 And in front of us were three jellies, a banana jelly, a dragon fruit jelly and a pumpkin jelly. I have never had banana jelly in my life and the chefs did use fresh bananas for this. I preferred the dragon fruit jelly and the pumpkin jelly although it should have been a trifle bit milky. All in all it was a good, fulfilling and well worth it. You might be wondering why this blog is so long. Well it deserves to be! The last time I wrote a blog this long for a restaurant, it was voted 5th best restaurant in Malaysia by Miele. I believe Chynnis is heading in that direction. I must say a restaurant that dares to have more then 120 dishes on its menu has a lot of guts, especially a new one like Chyniis which is just one and a half months old. The menu is extensive, a must try is the Chynnis Sang Har Mee and something else I noticed for next time, Kerabu Sea Birds Nest. Unlike other Chinese Restaurants, Chyniis boasts a vast beverage menu with various mocktails, smoothies, frappes, and even iced lattes. Now that is a whole other blog. I am wondering about desserts though? Saw??? Talk to me Saw. Surprise us with some nouveau desserts like everything else you offer. 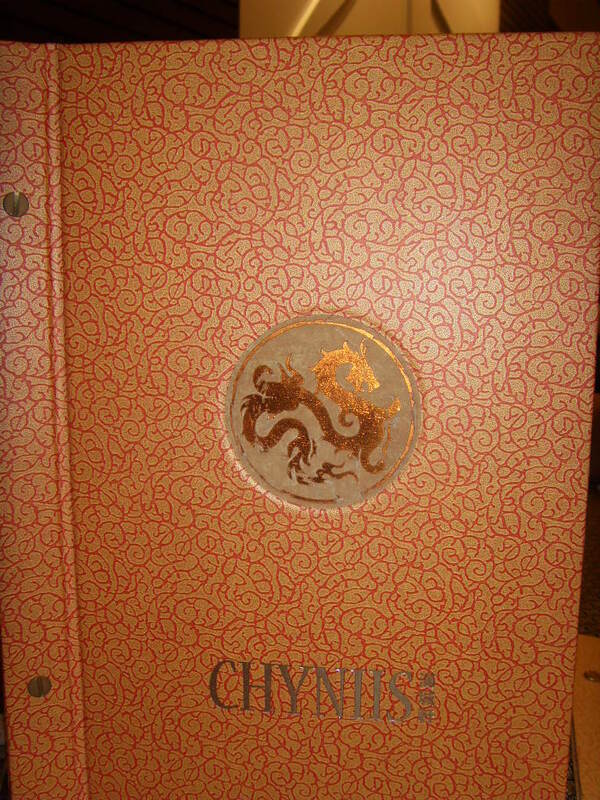 I believe Chyniis is on it way in carving a niche for itself in the Fine Chinese Restaurant sector. This very restaurants existence is a reason you MUST go to SSTwo Mall. Weddings will never be the same. I hope a few of my friends will hold their weddings here soon. Please do, I’ll even help you choose what’s good. 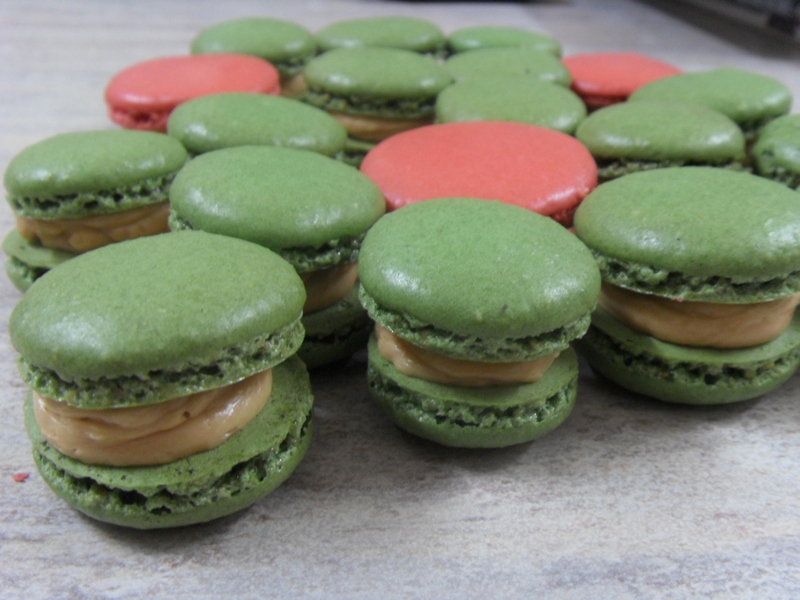 A fully hands on class, making French Macaroons with different fillings. I can only take 5 students per class due to oven space. This is a fully hands on class. Please bring containers to take your macarons home. Class will commence once there are 5 or 6 students. 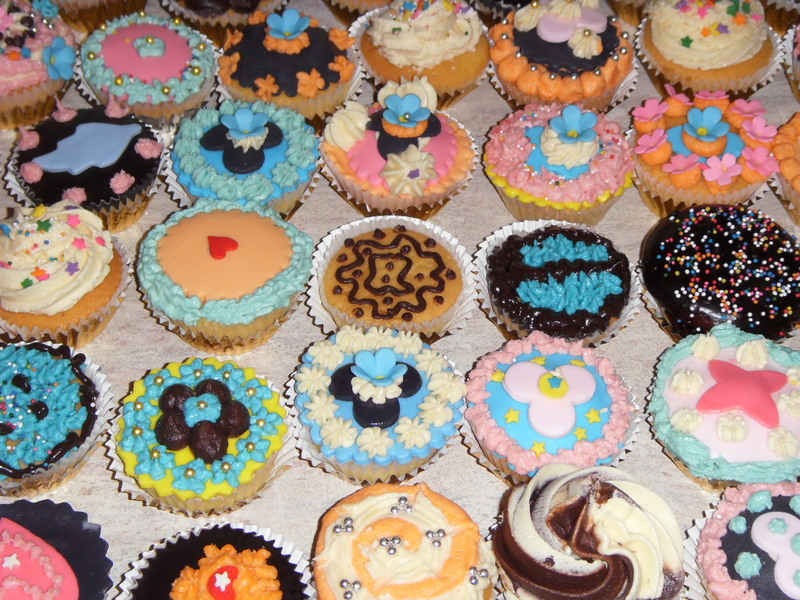 Each person gets to take home 8 decorated cupcakes. All ingredients will be provided. 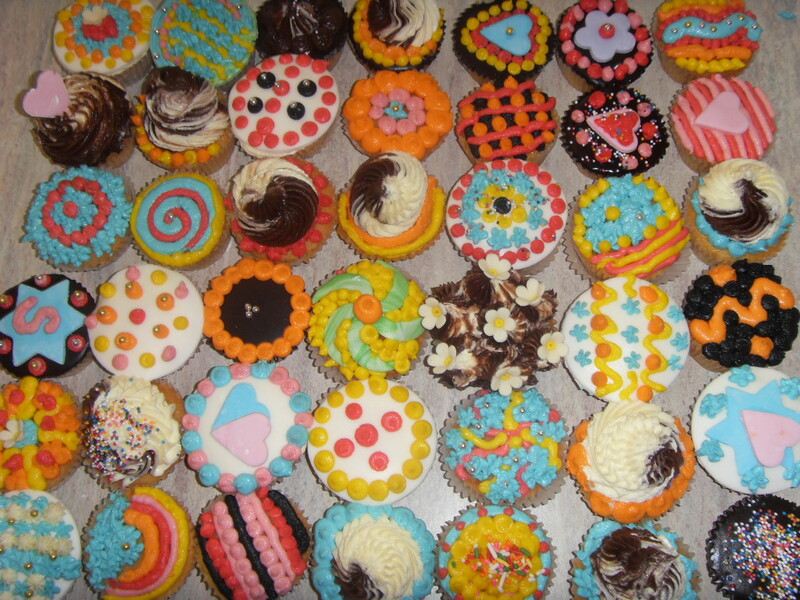 Kindly bring a container to take home your cupcakes. A proper 4 course meal will be served. Price Per Person: $85 inclusive of notes. Class will commence once there are 6 students. Learn to make these easy pick and go Chocolatey snacks.Ideal for Tea, and to make the kid happy. 1. 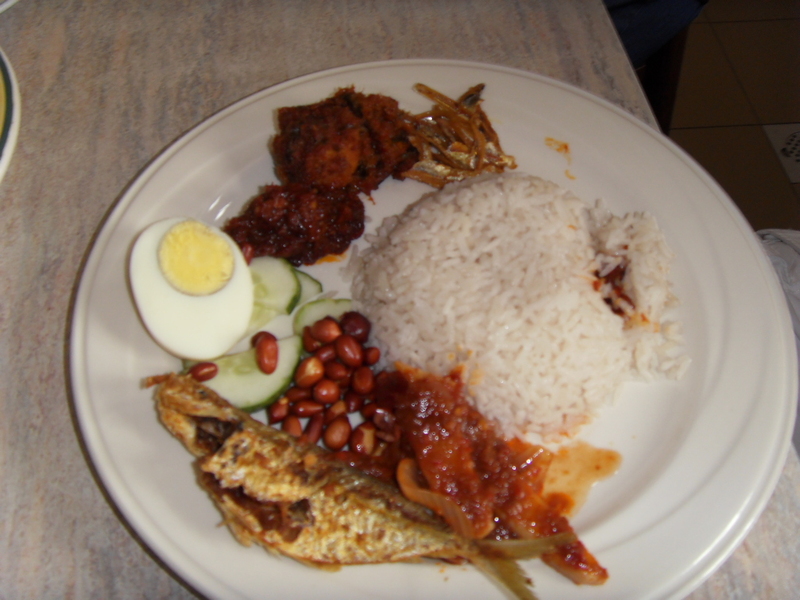 Nasi Lemak Kukus – not the rice cooker kind but the real steamed kind. Then we will all sit together and have Nasi Lemak complete with the rest of the trimmings. Price Per Person: $115 (Class will commence once there are 5 students. 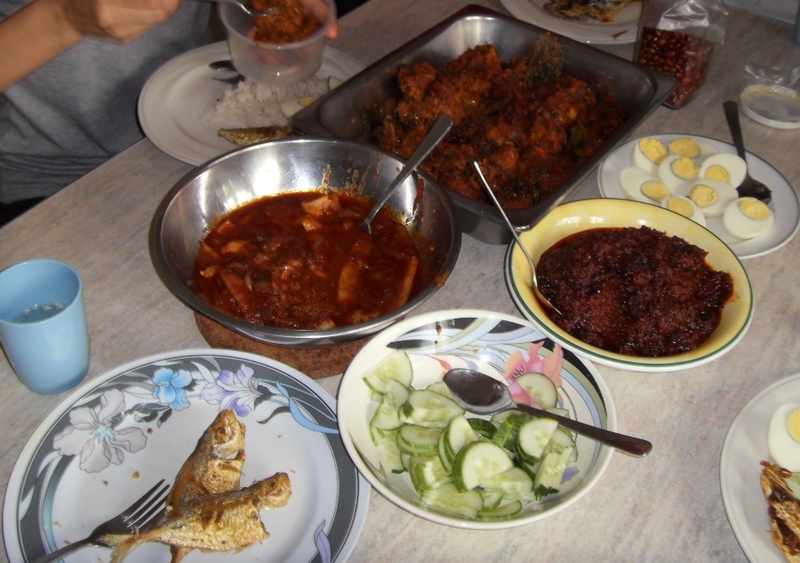 Learn to make Malaysia’s favorite comfort food. We will learn to make a portioned cheesecake and whole cheesecakes. These are rich cheesecakes and not the type you find in our local cake shops.